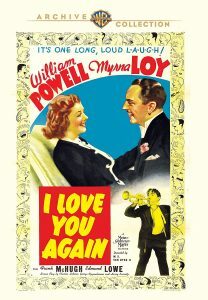 In I Love You Again, William Powell and Myrna Loy star in this comedy about a seemingly staid married businessman whose recovery from amnesia exposes his past existence as a con artist. In short, I Love You Again is a hilarious romantic comedy! It may well be the funniest movie that William Powell and Myrna Loy ever made. The basic story begins with a stuffed shirt (William Powell) on board an ocean cruise. He jumps overboard to save a drunken man overboard (Frank McHugh) – and his life changes in that moment. He comes to on ship a changed man — a con man, in fact. Apparently, nine years before, he’s suffered amnesia, and became a dull, stuffy, honest man. And the con man plans to take “his” money, and con “his” home town out of every penny. And the rescued man is a minor con man, who vows to help the man who saved his life. He goes on to become his right-hand man. ﻿ When the ocean liner docks, he’s smitten by a beautiful woman whose come to meet the boat – Myrna Loy. Who he soon discovers that he’s actually married to; but she plans divorce. So, he wants to woo his wife, while pretending to be his stuffy alter ego, and con the town with a oil scheme. In short, it’s hilariously funny, fast-paced, and higly recommended. Kay Wilson (Myrna Loy, Libeled Lady). Larry Wilson’s beautiful wife. Who has been treated by her husband as a thing, to be used as he aspires to be … president of the Chamber of Commerce. And she’s tired of it, and about to divorce him. But … after he returns, he seems different. And she slowly, gradually, falls in love with her new/old husband. ‘Doc’ Ryan (Frank McHugh, Miss Grant Takes Richmond). The man Larry/George rescues, who then becomes his right-hand man. And pretends to be a doctor, to help his cover as “recovering” from the boat rescue. A very funny performance! Take a refreshing plot with a novel twist, add line after line of wonderfully saucy dialogue, garnish with top-notch direction by W. S. Van Dyke II, and the result is one of the brightest romantic comedies ever essayed by the William Powell-Myrna Loy team. In this wildly original tale (by Charles Lederer, George Oppenheimer and Harry Kurnitz), Mr. Powell plays a big-city confidence man who awakens from a nine-year amnesia to discover he has become the manager of a small-town pottery works, joined the Elks and married Miss Loy. Partnered in a phony oil scam, he continues the charade, only to find that Miss Loy is about to divorce him for being such a fuddy-duddy! His problem: How to get the dough, avoid discovery and re-win the heart of his wife. The result is an unpredictable melange of swift gags and clever one-liners. William Powell and Myrna Loy. Screen legends. And a barrel of fun!